In this season of charity, I’d like to talk about the fate of the less fortunate to make clear how our politics has been turning a blind eye to the damage it does. When we aren’t responsible for the costs imposed on others, we will continue to hurt them. Economists call that externalities. Businesses don’t have to pay for the effects on our environment so most businesses continue doing global damage just as much as if they were perfectly benign. Forcing businesses to pay for workers’ injuries, forced them to take account of ways they could save money by protecting their workers – not out of the goodness of their hearts but because the legal system said they had that responsibility. When costs are internalized, they result in better overall decisions. In the law of eminent domain, cities have to pay for taking people’s property regardless of how wonderful their plans. They have to internalize the costs their plans will do to the owners of real property. When they did urban renewal, the cities didn’t have to pay for the businesses whose customer base was destroyed, and they didn’t have to pay for forcing people into much less safe or appealing housing or projects. So cities avoided taking high priced real estate but they freely wiped out the businesses of the most vulnerable. Those costs were externalized, imposed on other people who had no choice in the matter. In fact our system makes scores if not hundreds of thousands of innocent victims with no thought of internalizing the damage and paying any form of compensation. When an individual is wrongly imprisoned for a quarter century and is lucky enough for someone eventually to find a way to convince the courts to let him out, with DNA or other conclusive evidence, that individual has to prove that someone was not only derelict in his or her duty, but did not have one of the many privileges that the law gives people in the criminal justice system, or that the city or state was derelict in its duty of supervision and training, before that individual has any right to compensation. Everyone in government gets to smile and say justice was done while continuing to do the kind of careless investigation and sometimes deliberate withholding of evidence that kept people in prison. They aren’t made to internalize the costs of their misbehavior. Would police departments be so happy to retain police officers if the department budget took a big hit every time a cop guessed wrong and shot an unarmed civilian? Or would the department institute practices to make that stop? In fact our law makes the victim or survivors prove specifically what the city should have done in training or by regulation or what the officer should have done under the circumstances. Asking only whether the officer’s behavior was reasonable, the law doesn’t take account of the reasonableness of the victim’s actions. In other words, instead of making the officer and the city responsible for their mistakes, it puts the risk of police error on the individual. Of course that is typical of American law – protect those who don’t need it but leave the vulnerable in the gutter with a sheet and a prayer. There’s little justice in America for the vulnerable. — This commentary was broadcast on WAMC Northeast Report, December 29, 2015. At this season in which charity is high on our agenda, I’d like to address some economic issues. I recently spoke with you about what the oligarchs are doing to American democracy. This time I’d like to talk with you about is happening to our jobs and wages. Jobs have recovered slowly from the 2008 crash; wages have flatlined for a decade. Candidates should be talking about jobs and wages. Some want to turn money over to what they call the “job creators” – fabulous, fairy tale language. When taxes were cut to the 1%, the great bulk of that money didn’t finance jobs, or even trickle down to the rest of us. The 1% used it for finance, to jack up asset prices, buy and sell companies, close factories and outsource jobs abroad, or build McMansions, everything but better lives for American workers, who put in long hours at multiple jobs, with little to show for it but worry about the future. Creating jobs by lowering taxes hasn’t worked for decades because we already did it decades ago; now it’s become a fairy tale told for the gullible. It’s amazing the demonstrable nonsense that people can convince themselves of. Our society insists it’s everyone’s personal responsibility to find work. As a legal aid lawyer, I worked closely with unemployed, mostly African-American clients. I felt like I was watching them die. Losing a job left them feeling worthless; nothing was more deeply hurtful or more threatening. With little to tide them over, they lived where they could afford housing, far from jobs, without cars to get to interviews or available work, or any network of employed friends to point them to possible jobs. On-the-job training left them few transferable skills, and parents struggled to find affordable day care. The more they needed work, the harder it was to find a job. We had a fellow do odd jobs, yard work, pick up bottles and cans for the deposit, after losing his last job for lack of transportation. A lawsuit for unrelated injuries got him enough to buy a car. Instantly he was working, steadily. The stuff called tough love isn’t love but it is dumb. People without assets or work become vulnerable to doing anything just to stay alive. That affects all of us. The unemployed cost us money, for unemployment insurance, because of the dislocation that unemployment generates, and for lots of police because we fear the jobless. They cost us money because of the decrease in property values, the poor prospects of their children and those who live in areas of high unemployment. We pay in the fear of going out at night or stepping on to the wrong street; and we lose the multi-generational workforce we want for our own programs and projects. Any responsible business person would include all the costs to individuals and our communities in their balance sheet for deciding whether to support a job program. To evaluate the cost to each of us individually in taxes, compare it to the taxes we have to pay for not putting people to work, as well as the value of the work they could do. The notion that all taxes are bad for us, is sloppy economics. Justice, fairness and safety are not trade-offs but different sides of the same coin. I’d put people to work rebuilding and improving the infrastructure and other needed projects. There are a lot of things we can do to boost the economy and provide jobs if we are not bamboozled by fairy tale language about what the princes would do for us if only they had even more money. — This commentary was broadcast on WAMC Northeast Report, December 22, 2015. I want to address one of the issues coming out of recent events on college campuses, not to mention the rhetoric of Mr. Trump. Frankly, I’m fed up with the attack on what the right wing calls political correctness. Apparently some think the condemnation of racism in our social interactions is merely political correctness. It should be open season on everyone. Of course that’s a two-way street. I can think of all sorts of epithets and insulting language to hurl at people who would protect nothing but their own right to trash everyone they dislike. That of course describes Congress – the wraps are off all forms of battle. There are no rules in a knife fight as a legal scholar once titled an article. Apparently civility is the enemy. I think of politeness as normal and proper behavior in a democratic or any society. People were civil to me in Iran regardless of their reactions to my nationality or religion. But some denounce the very idea of civility, of being polite. Civility and politeness are essential to democracy because we have to live together. They are essential to democracy because we have to work across disagreements to get even the things we all agree on done. They are essential to democracy because if we make each other the enemy we are headed toward the breakdown of all democratic institutions, starting, as the Rehnquist Court made clear, with vote counting. Polite behavior toward each other is essential because without it we are headed toward violence. I did not grow up with prejudice against Blacks but I did grow up with plenty of other instinctive prejudices that I did not investigate because they seemed so ordinary. Nevertheless I did not go around hurling epithets at people. I eventually learned to bury those prejudices, at least those of which I am aware, and to fight against the mistreatment of those selfsame people by our government and society. But being polite was always a different issue. It was about the respect that we are bound to show all people in a democratic society. As you all know, I teach law. And I have often taught practice skills, interviewing, litigation, trial practice. I do not teach people to walk up to the jury box and ask a juror why we should want an ethnic, racial, or religious so-and-so like you to sit in the jury box. I do teach my students that talking with people or interviewing witnesses or clients requires respectful listening and showing some understanding of what they are trying to tell you regardless of what you may think of them. That’s necessary to get the job done. When the people become the issue instead of their behavior, politics becomes particularly dangerous. When politics is no longer about issues but about people, it’s not just whether they lose a political debate; it’s that people stand to lose everything, to lose the protection of the laws. And by the same token the oppressors become the proper subject of the laws. From the behavior of the right, or wrong, wing, I question whether they believe in democracy, and therefore whether, by their defense of political incorrectness they, the wrong wing, are entitled to respect. Makes me want to solve our political problems by just giving Texas back to Mexico. — This commentary was broadcast on WAMC Northeast Report, December 15, 2015. 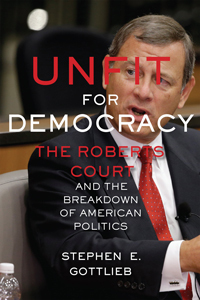 NYU Press tells me that Unfit for Democracy will be available in book stores some time in the first week of January. The finished copy looks excellent to the author! the Demos Convening on May 24-25 at the University of Pennsylvania. Please get in touch with me if you are interested in arranging an event. For some people, the best solution to every problem is to shoot at it, and presidents aren’t leaders unless they’re yelling “charge” into battle. I want to bite off a domestic piece of that nonsense. In the wake of every terrorist tragedy, senators, sheriffs, NRA officers and supporters propose more guns, carry your guns, be ready to defend yourself, ourselves, wherever and whenever occasion arises. We have some 15,000 murders a year in the U.S., 40,000 suicides, mostly by firearms, and under 30 deaths a year from terrorism. CNN checked Obama’s comparison of deaths by firearms and by terrorism in the U.S. From 2001 to 2013, they found that people killed by terrorists in the U.S. were less than 1/1000th the number killed by firearms. Firearms deaths dwarfed terrorism deaths even in 2001. Whether it’s a good tradeoff depends on what gets worse. Note though, if we’re all armed, we’ll need to do things differently. Once we assume everyone is armed, when someone demands something, whatever it is – turn off the radio, get out of my way – are we toast if we don’t comply? Do guns become the tool of bullies? Isn’t that some of what police shootings of unarmed people reveal? Police say they were scared because someone with his back turned may have had something in his hands. Do we all get to be that scared, pulling the trigger at anyone whose safety we can’t determine? We’ll have to be suspicious. Who’s hot tempered? Who’s too scared to trust? Who’s a criminal, terrorist, gang member or bully? America was built on trust and teamwork. Break that down and sap our strength. We might stop some terrorists but America’s strength will dissipate in squabbles and fear – like those that poison and stultify much of the Third World. Arming ourselves will partially thwart some similarly-armed terrorists but guns can be replaced by explosives which do their damage before anyone knows what’s happening. A couple of decades ago a disappointed former student attacked our library – but thank heavens he attacked a glass door with an axe rather than attacking people with a gun. No school can avoid flunking some students out and no employer can avoid firing some employees. One such employee got a gun and murdered one of my clients some years ago. But the police are taught that it’s too late to react once someone starts to pull a gun. My client, armed or not, never had a chance. So now what? There are alternatives. I’m a civil libertarian but I have no problem with cameras. Security staffs at many places have monitors showing them many parts of the building. I’m a lot happier with observe-and-respond than having a bunch of trigger-happy gun toters wandering around wondering if I or anyone else should be shot. Similarly, with the repeated police shootings of unarmed men, I’d be a lot more comfortable if they left their guns at the station for access only as needed. I’d also be much more comfortable with police departments and the FBI if they stopped bribing unreliable informants to trap people in stings, send innocent people to prison, and corrupt the Bureau in the process. Have a tool, use a tool. These are dangerous tools for routine use. America would be much safer if we found ways to build on our principles, instead of abandoning them in the chimerical belief that we could protect ourselves better with guns. — This commentary was broadcast on WAMC Northeast Report, December 8, 2015. See https://www.fbi.gov/about-us/cjis/ucr/crime-in-the-u.s/2011/crime-in-the-u.s.-2011/violent-crime/murder; http://www.save.org/index.cfm?fuseaction=home.viewPage&page_id=705D5DF4-055B-F1EC-3F66462866FCB4E6; http://www.cnn.com/2015/10/02/us/oregon-shooting-terrorism-gun-violence/ . Two things have been capturing our attention, the plight of Syrian refugees, and the environmental summit in Paris. They are in fact closely connected. First, immigration is valuable to us. Immigrants bolster national power – it matters that China and India have a billion people each. Immigrants grow the economy and make it easier to sustain what’s left of our social safety net because they work and contribute. They are productive partly because they are new blood, and look at things with new eyes. This country has been at the forefront of innovation since it was founded because mixing peoples from different countries and parts of the globe consistently stimulated and refreshed the American economy. With globalization that is even more important. So for national security, economic health and continuing the path of American innovation, immigration is a big plus. In the case of refugees, generosity is also a big plus, good for our hearts and good for making America the world’s destination. Immigration is not without problems. In the short run, the impact on jobs seems to be a wash – immigrants compete for existing jobs but create new ones by expanding the market. There is reason for concern that some supporters of DAESH (also called ISIL) could get in, but DAESH now has American supporters with passports. So the problem is much broader and needs to be dealt with in a broader way – Americanizing immigrants by reaching out, welcoming and including them in our activities. But there is a problem. World population has tripled since I was a youngster. That’s an explosion. Chinese authorities understood that China could not sustain population growth and slowed it precipitously. Immigration initially doesn’t change world population. But the ultimate impact will result from improved health, cultural change, and rising living standards. Americans consume far more than our proportion of the world’s resources and we produce far more carbon dioxide and other toxins than our proportion of the world’s population. That is ground for concern. And immigration will stress the environment of some states and communities. We can enjoy the benefits of immigration IF we can limit and reduce the environmental damage. It means that we should, must, continue to invest in ways to reduce our use of fossil fuels, and increase our use of passive solar heating and solar and wind energy. We must control our overuse of water, and invest in better ways to use it. We need to rethink our national land-use policies – irrigating deserts for farmland and building suburbs on productive lands with an abundance of water is wasteful, leading to drought, salinization of the land, and making many places unlivable. Ultimately both our goals for immigration and our goals for America, our children and grandchildren must be driven by concern for the people who will inhabit it. That means care and concern for the immigrants and all of us, expressed through environmental policies that can keep the earth habitable. In that effort we have to be willing to share and accept effective regulation. There is no other way. — This commentary was broadcast on WAMC Northeast Report, December 1, 2015. You are currently browsing the Constitutionalism and Democracy blog archives for December, 2015.